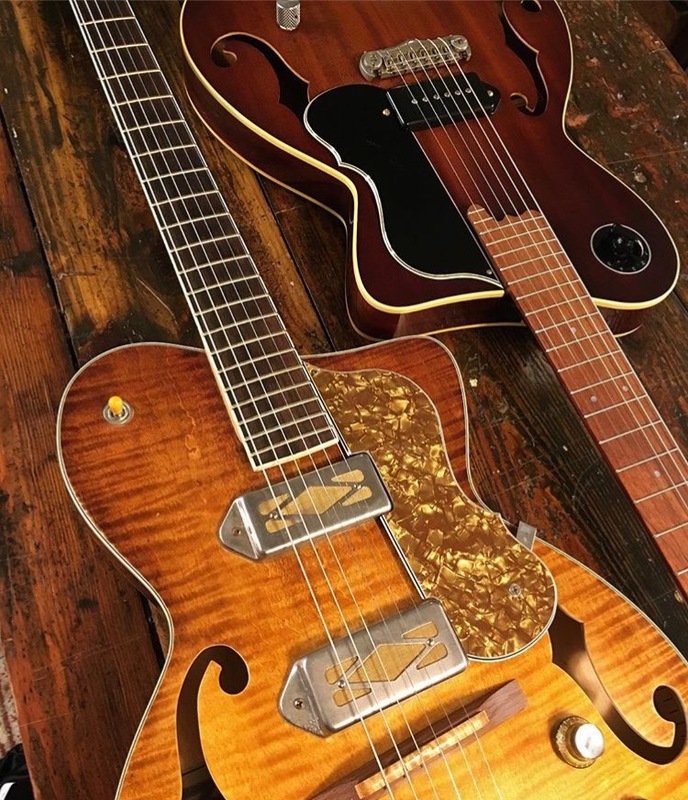 There are a lot of things to like about The Music Emporium, but first and foremost lately is how it has embraced innovative, independent builders, bringing in instruments from FJ favorites like Creston Lea and Joe Yanuziello, and introducing us to builders like Glenn Nichols. In some ways, Glenn’s Retrograde Guitars remind us of Yanuziello’s creations – they both to draw on the “catalog” guitars of the ’60s for inspiration – but where Joe has applied his craftsmanship to create distinctly modern, updated versions of those guitars, with sleekly machined, chrome-plated bridges and tailpieces designed with tight lines, Glenn has opted for more of an Old World style, a “retrograde” approach, if you will, with hand-rubbed varnish finishes, cedar necks and maple bridge saddles, soft curves and notably classically-inspired f-holes. We reached out to Glenn and he willingly let us subject him to the Bench Press treatment. 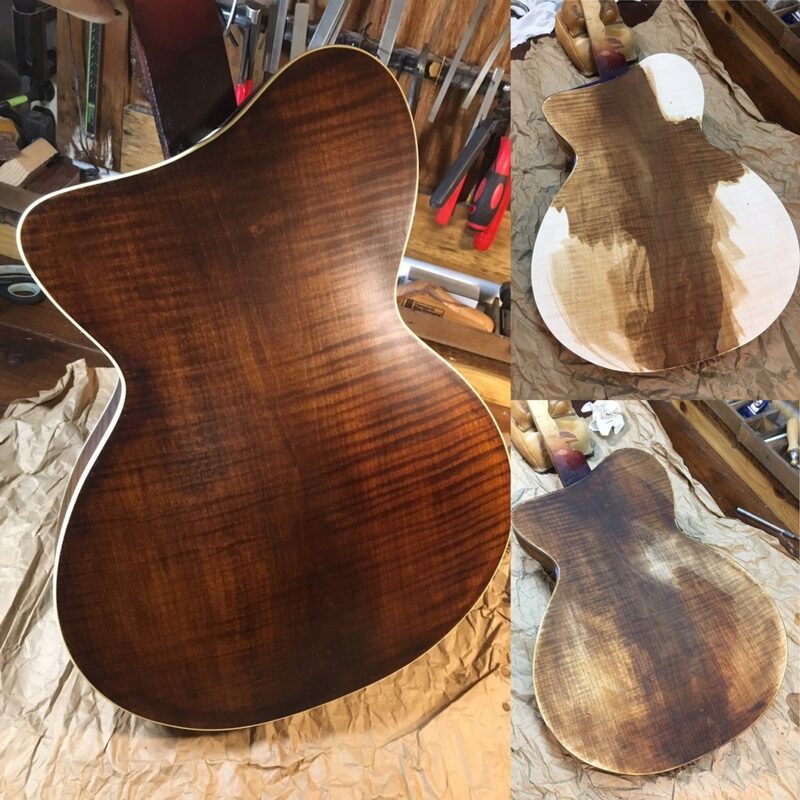 Glenn Nichols: Right now, I’m putting the finishing touches on a Retrograde Cambridge model. This one features two “Kleenex Box” style single coils by Mojo pickups from the U.K. The look is loosely based on an old Kay Barney Kessel model. Although it looks funky, the tonal range reminds me more of the first three positions on a Strat. It’s not what you would expect, and that’s exactly what I like about it. I began as an artist, studying painting at the Montserrat College of Art in Mass. 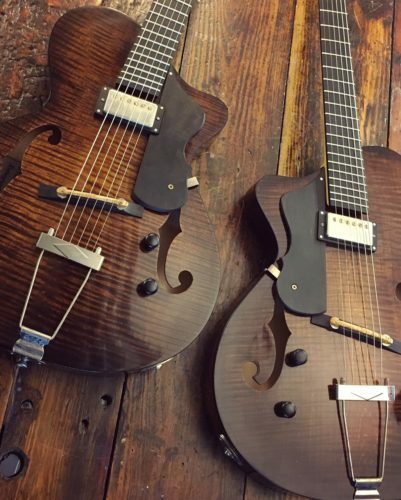 I learned how to build guitars at the Roberto-Venn School of Luthiery in Arizona. I was the foreman of the finish department at Santa Cruz Guitar Company for nine years. 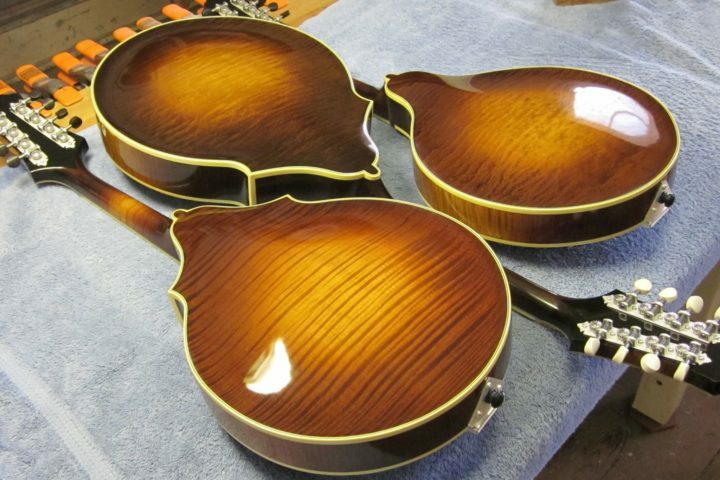 I was in charge of French Polish and repairs for Kenny Hill Classical Guitars for three years. 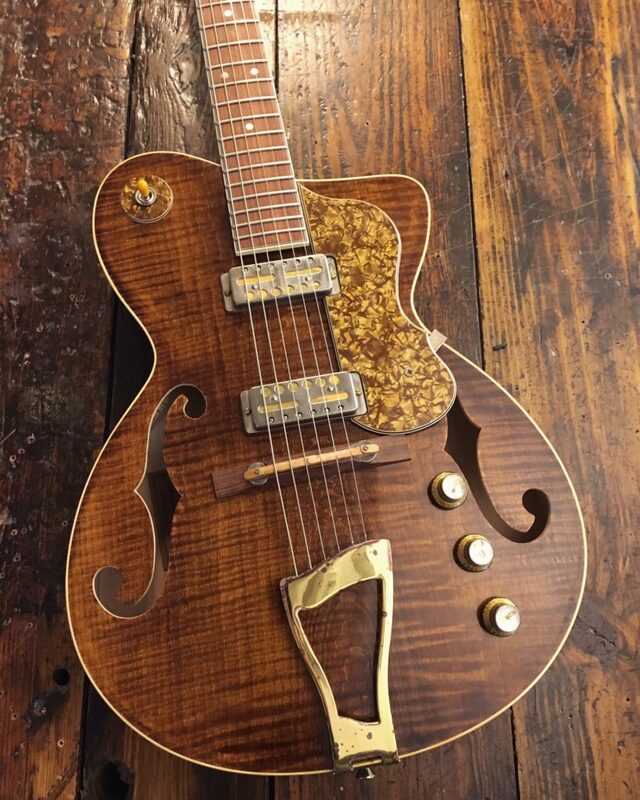 I have worked for Tippin Guitars in Marblehead, Mass., on and off over the years as well. I’ve learned a lot about running a small shop from Bill, and I still work for him a few days a month. 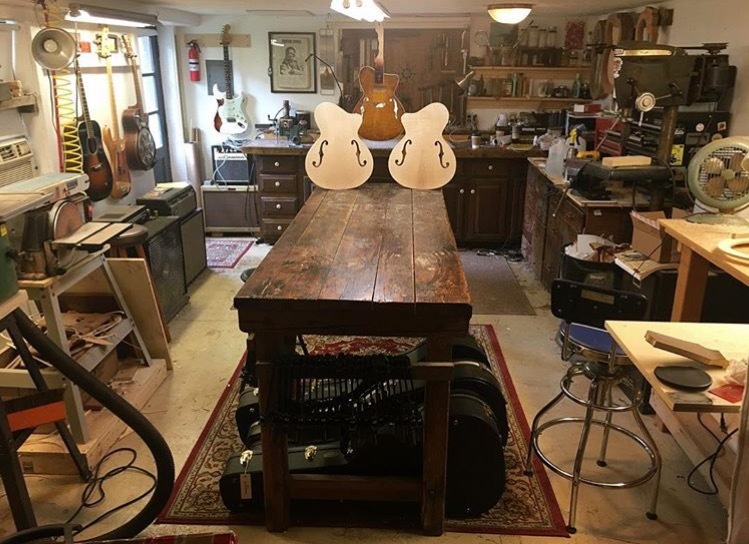 Each one of these shops had a major influence on how I approach guitar building and repair. Whenever a young aspiring luthier asks me how to get started in this business, I tell them this: Find a guitar shop, and work in it. GN: When I was 14, a music store opened up in my neighborhood. It was close enough that I could ride my bike there. Tucked in the corner of the shop was a 1966 Silvertone electric guitar for $75 dollars. 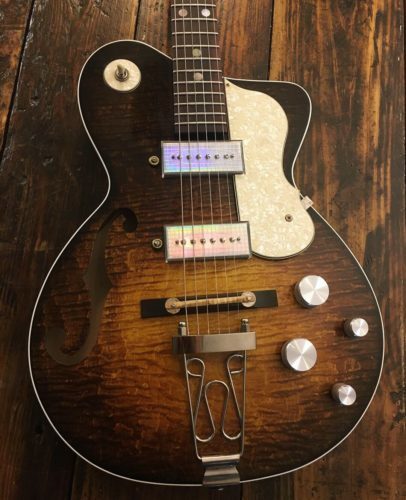 It had a sunburst, a cracked pearloid pickguard, and two DeArmond pickups. It didn’t look like the other guitars. It was worn and dirty, and no one seemed to pay it any mind. I could feel that it had a history, and it made my stomach feel funny. After I saw it, I got on my bike and furiously pedaled home to get all of my lawn mowing money, even though I had no idea how to play the guitar. I think all guitar players share a similar experience, and it can be life changing. I find inspiration in trying to recreate that feeling for people. I want to create something that pulls at your heart strings, and plays with your emotions, and inspires creativity in return. My daughter now plays the ‘66 Silvertone. FJ: How does your restoration work relate to your work as a builder? GN: I could never do one without the other. By doing restoration work, I am able to study guitars, inside and out. You start to see patterns, like vintage Martins crack at the edge of the pickguard because they are glued directly to the top, and they shrink over time, or early ‘70s Ramirez guitars tend to have low neck angels. I gather information and compare it to my own methods. I try to avoid the pitfalls of the past, and take what works and apply it. It’s not a conscience thing; I don’t write it down or make graphs or anything. You just gain intuition based on experience. It’s also a great feeling to bring someone’s treasured guitar back to life. 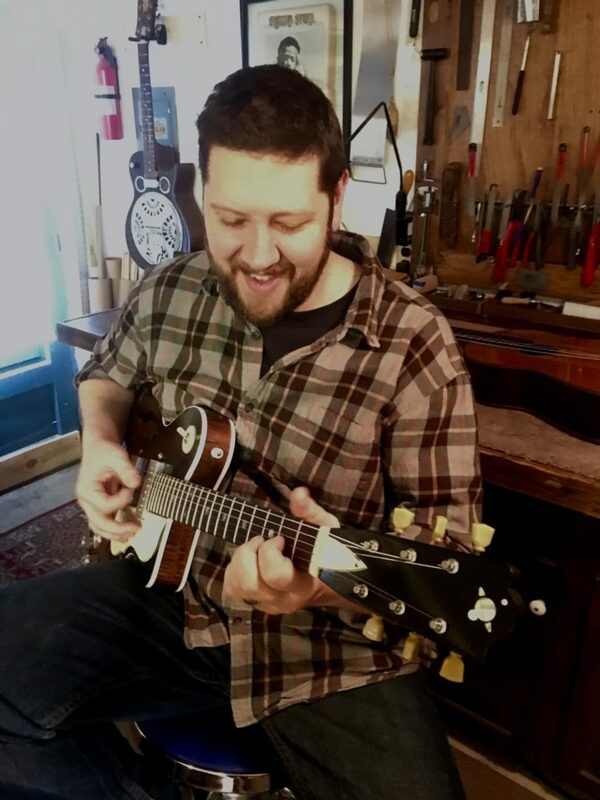 I often hear stories like “This was my Mother’s guitar and she used to play it for me when I was little,” or “ This was my Grandfather’s guitar and I want to restore it for my daughter.” Those are great stories that I love to be a part of. 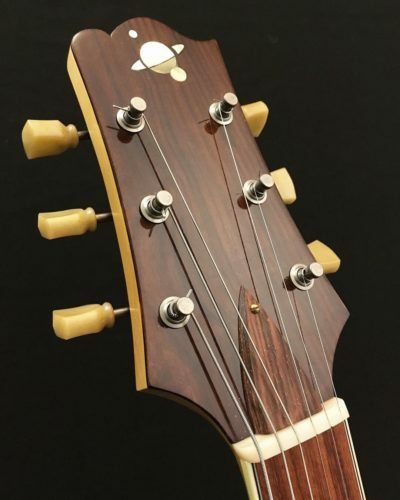 FJ: Do you have a favorite guitar that has crossed your bench? GN: No way, I’m still searching! I think guitar players love the pursuit. We all have keepers, but we all have more than one. GN: I am in Norfolk, Massachusetts. My shop is on the basement floor of a house that my wife’s grandfather built in the 1950s. The land has been in her family for generations. The area used to be mostly farmland, with a small town center, but it is quickly growing into a Boston suburb. We have some chickens, and a large garden. It’s a perfect location because it’s off the beaten path, but still within an hours drive of Boston and Providence, Rhode Island. I even get customers from Connecticut, New Hampshire and New York. The shop itself is built into the side of a hill, with a door accessible to the outside. I have windows, and the humidity is easy to control. I get to be home to put my kids on the school bus, and be there when they return. I am very grateful for the space, and I really couldn’t ask for more. FJ: Do you have a particular philosophy about wood or materials? GN: I purposely work with a very limited pallet of maple and mahogany. By limiting my wood options, I gain a better understanding of how they work when paired with each other. My number one concern is strength-to-weight ratio. I create my tops by vacuum pressing five laminates of maple, with a single laminate of mahogany in the center. This creates a very stiff, yet light and lively top. I then brace the top as you would an acoustic archtop, using either German or Adirondack spruce. The kerfing is either mahogany or basswood. I have learned not to underestimate the difference kerfing makes on an instrument’s projection. For the necks I use either Spanish or Port Orford cedar. 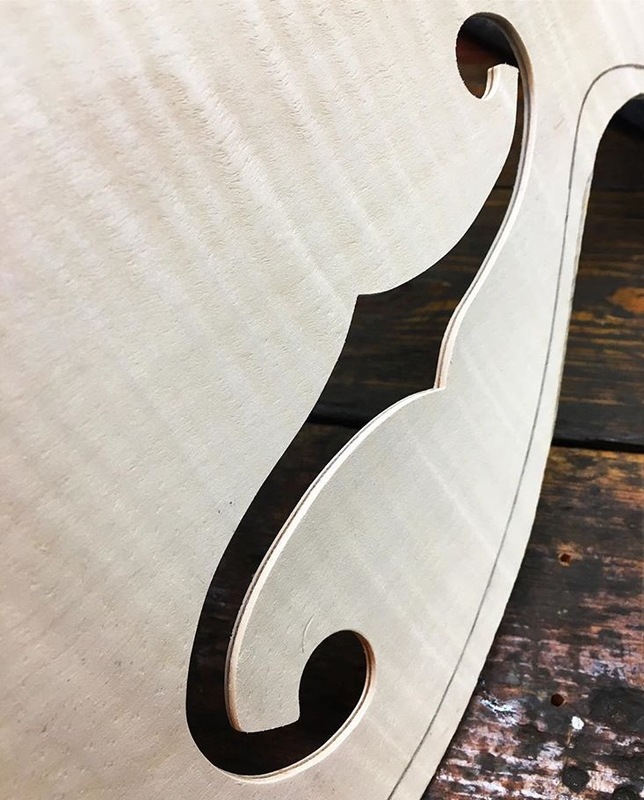 These wood choices are common in the classical guitar world, and they cut the weight down considerably. The average weight of a Cambridge model is around five pounds. I love the look on people’s faces when I hand them a guitar. It’s like handing them a suitcase that they think is full, but it’s really empty. I build my guitars to have a warm, open tone, with an airy bass and a crisp treble. I like to use lower output pickups, such as gold foils, or early P.A.F.-inspired humbuckers, to take full advantage of the acoustic qualities. The world of boutique amps and pedals is so vast that I want the first link in the chain to be as clean and pure as possible. FJ: What’s the secret to a great finish? 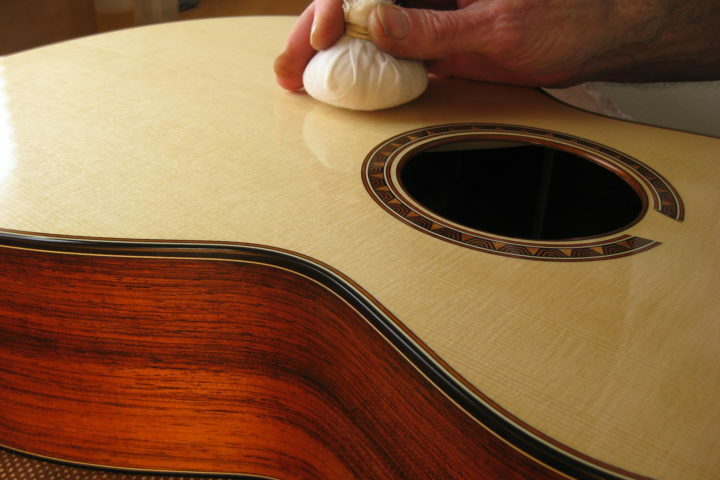 GN: The first function of an instrument finish is to protect the wood. 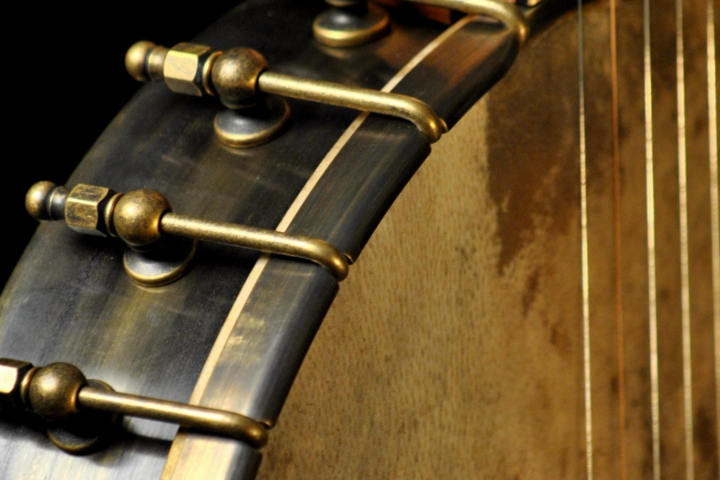 The secondary functions are to enhance the wood’s beauty, and color the instrument’s tone. 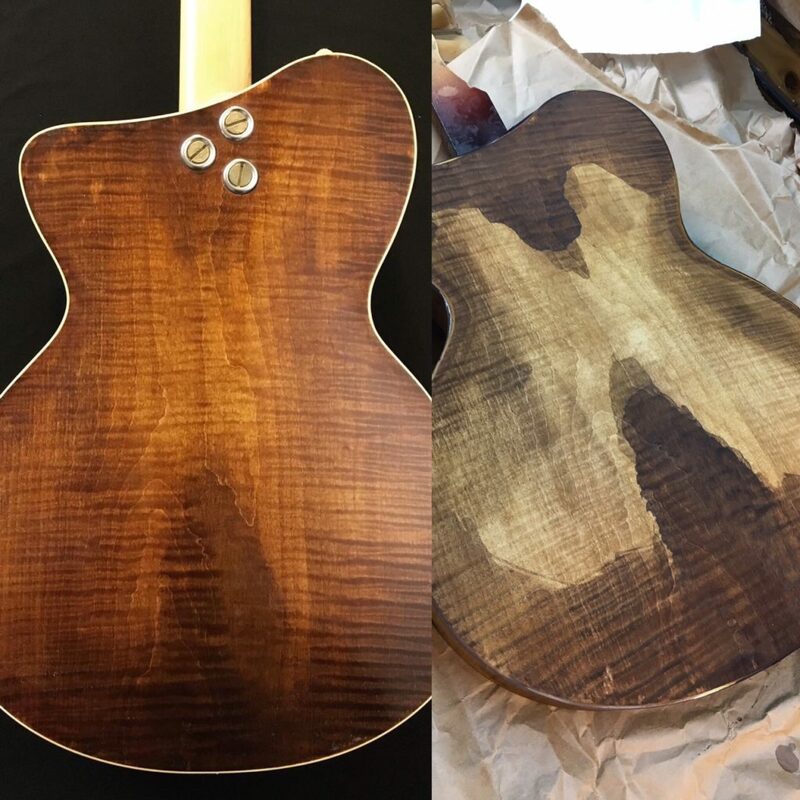 Every finish will affect the tone in a different way. I stopped searching for the “best” a long time ago. Now I just try to understand the differences, and apply them where I see fit. If you asked me this question six or seven years ago I would have said, “A great finish is 5 mil thick, with no shrink back or blemishes. It has to reflect like a mirror, and shine like a million suns. Please don’t touch it.” But over the years my approach has changed. For me a great finish is inviting, and makes you want to pick up the guitar. It makes you want to feel it with your fingers, and smell it, and wonder how it happened. It has to tell a story. I want it to be textural and painterly, and make the player feel comfortable, and at ease. I want to make an instrument that inspires musicians to create, not a trophy to keep in a case. I want the finish to wear as you play it, and break in like an old pair of boots. When you walk into my shop, I want it to smell like an artist’s studio, not an auto body shop. All of my finishes are hand-rubbed; I don’t spray anymore. I cook up the spirit varnishes on my kitchen stove. The finish is my favorite part. Sometimes I feel like building the guitar is just an excuse for me to make more canvases to paint on. I think a great finish should feel effortless. Once it’s been labored over, the magic is gone. I do believe, most importantly, that the same rules apply in painting: You can’t do it wrong, until you know how to do it right. All of the best abstract painters evolved into it after having full control of their materials. I think by having a free and flowing process, you can actually charge the instrument with inspiration, and make a conduit for creativity. I think a lot about guitar finish. FJ: Are there any upcoming projects that you are excited about? GN: I’m excited about the future in general. My business is young and there is so much to do. I’m just happy and grateful to finally be the captain of my own vessel. I’m fortunate to have found a way to live in this world as a creative person, and to truly do what I love. I’m excited to keep this up for as long as I can.